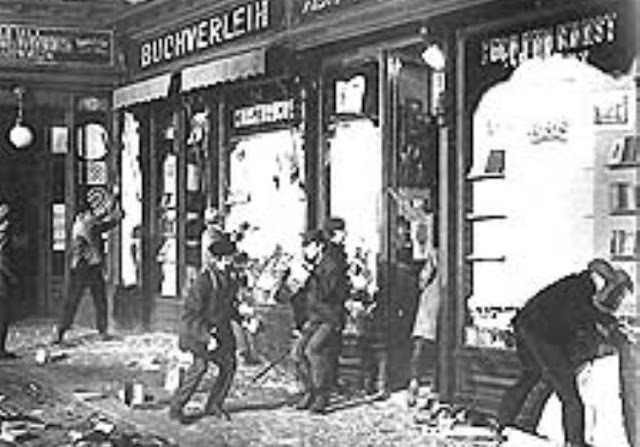 Germany, Holocaust: Kristallnacht is the name given to an organized outburst by Hitler's forces against indigenous Jews and Jewish-owned businesses throughout Germany and Austria. It took place on the night of 9-10 November 1938. It is sometimes described as the beginning of the Holocaust against Jews throughout Europe - though another significant date was 20 January 1942 and the Wannsee Conference.. The genesis of the incident was somewhat convoluted. Herschel Grynszpan was a Polish Jew living in Paris. On 27 October 1938, his family was suddenly expelled from Hanover, Germany, where they had been living since 1911. Some days later, Herschel received a postcard from his family that they had sent from the Polish border. This infuriated Herschel, who immediately bought a pistol and ammunition. In an agitated state, he went to the German embassy on 7 November 1938, asked to see any German official, and met minor functionary Ernst vom Rath. Grynszpan immediately shot vom Rath, hitting him twice and leading to Rath's death on 9 November - coincidentally, the anniversary of the failed 1923 coup that was celebrated widely in Hitler's Germany. Somewhat ironically, the randomly selected vom Rath was an anti-Third Reich conspirator himself under watch by the Gestapo. The German state reacted instantly to the shooting. Jewish children were barred from elementary schools, Jewish publications were halted, and other harsh measures were adopted. Adolf Hitler, in Munich commemorating the anniversary of the Beer Hall Putsch, cancelled a speech. It instead was given by Propaganda Minister Josef Goebbels. Goebbels used the speech to incite the events that followed, saying that any reprisals taken against Jews for the shooting were "not to be hampered." Police forces throughout Greater Germany, primarily SA Brownshirts, immediately took the hint and began destroying Jewish businesses and institutions. Some 200 synagogues were destroyed, over 7,000 Jewish stores, and Jewish cemeteries were vandalized. In addition, many Jews were beaten to death or injured, and 30,000 men reportedly were sent to concentration camps. The Jewish community also was fined 1 billion reichsmarks. All of this greatly understates the damage to the Jewish community. Not everyone in the German hierarchy was pleased. Some saw it as an example of Goebbels leveraging his friendship with Hitler to his own political advantage. Hermann Goering was in charge of economic policy, and he had to use scarce foreign currency to repair the damage. Plate glass, for instance, had to imported, and Goering complained loudly about the expense at the next cabinet meeting. Many of the Jewish businesses were actually renting from non-Jewish landlords, and much was insured by the non-Jewish German insurance industry. Heinrich Himmler also thought that Goebbels had been "stupid" for having incited the riots - he no doubt felt that the Jews could have been destroyed without the damage and diplomatic fall-out. Relations with other countries - which theretofore had been correct, if adversarial - were poisoned, and Germany became a pariah state except amongst its closest allies. There is speculation that Goebbels was really only seeking to curry favor with Hitler due to clouds hanging over his own head regarding his infidelities, and also simply to enhance his standing within the party after some ineffective propaganda efforts. However, he was simply taking advantage of hatred and resentment that had been building throughout the German dominions. He lit the fuse, but the box of dynamite already was there. 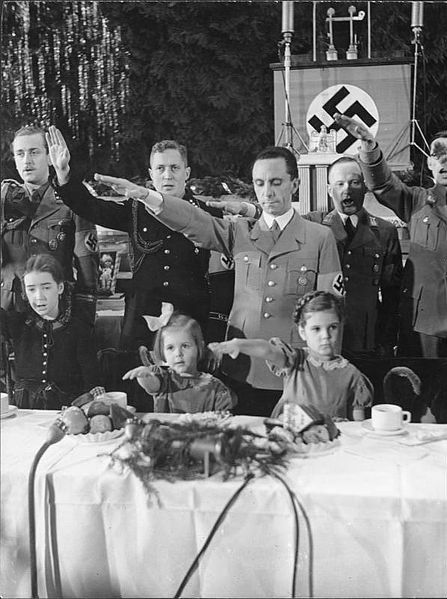 Josef Goebbels around the time of Kristallnacht, minding his children.